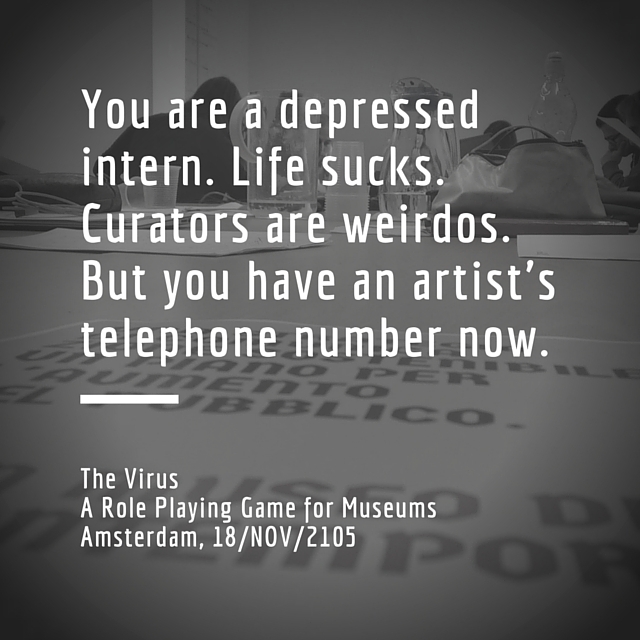 My role playing game “The Virus” is ready for its European debut. I will be playing a freshly revised version of it on wednesday 18 November in Amsterdam. I will be teaming with Jasper Visser who invited me to go dutch after I did a series of installments of “The Virus” in various italian locations including Turin, Bolzano and Bologna. The concept of the game is quite simple: aimed at students or junior professionals, it lets players experiment how actual communication strategies are developed in museums, theaters or center for performing arts. Unlike other workshops on issues of strategy, “The Virus” is not meant to provide tools, skills or a method. It is a complex game environment devised to imitate reality “as it is” and not “as it should be”: the game narrative has plenty of potential conflicts, budget issues, personality clashes and PR disasters. But of course it also allows for empathy, team collaboration, hints about audience development and ways to integrate artists’ visions into successful communicaton strategies. The role playing time, which lasts around one hour and a half, is followed by an open discussion, that draws on the insights gathered through personal stories. Players get usually very involved during gameplay, and therefore find it easier to access the final evaluation stage on a level that is not only intellectual but also emotional. Modeled after my professional experience in Italian museums, The Virus has been reshaped to take the italian-bias out – but I’m not sure I managed to do this. I’ll find out on wednesday. The Virus explained. Or maybe not so much.